Harrison Gimbel is only 25 years old, but he’s already been playing poker for half of his life. While other young adults struggled to find their calling, the Florida native has known he wanted to be a poker player since the Moneymaker boom. Gimbel didn’t have to wait long for his dream to come true. After getting his feet wet with online poker, Gimbel broke out on the live tournament scene when he was just 19, winning the PokerStars Caribbean Adventure in 2010 for $2.2 million. He has since made three World Poker Tour final tables and even added a WPT title in March of 2016. He now has $3.7 million in live tournament earnings, and another $1.8 million online. Gimbel grew up in Jupiter, Florida, about an hour north of Fort Lauderdale. He always looked up to his older brother Daniel, who was the first Gimbel to get bit by the poker bug. The elder Gimbel was a pretty good poker player and even took seventh place in the PokerStars Sunday Warmup back in the day, but it was Harrison who took the ball and ran with it. He attended The Benjamin School, a prestigious college preparatory high school in Palm Beach that boasts a 99 percent college acceptance rate. Gimbel didn’t hurt the school’s numbers, but he knew early on that he wasn’t cut out for another four years of school. Gimbel didn’t last long in school. An outbreak hit the state of Alabama and he developed a mild case of swine flu, which kept him off his feet for about a week. 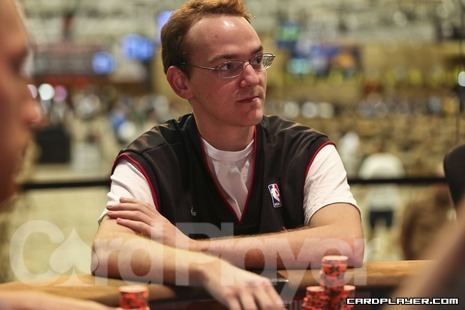 After he recovered, Gimbel just never went back to his classes, choosing instead to keep playing online poker. It was a bit of a hard sell for his family. He even managed to win a satellite into the Aruba Poker Classic. Gimbel got on the board with his first win in June of 2009 when he took down the Florida State Championship for $67,860. Six months later, he made his debut in the Bahamas, and won the PokerStars Caribbean Adventure for $2.2 million. Gimbel continued to do well, both online and live. In November of 2010, he won the Fall Poker Open Championship at the Hard Rock for $330,000. In November of 2011, he finished third in the Rock and Roll Poker Open main event and made final tables on the WSOP Circuit and at the World Series of Poker. In total, Gimbel has made 19 live final tables and somehow managed to win six times. While other poker players struggle to close out wins, Gimbel has done it during his career with remarkable consistency. In early 2016, Gimbel nabbed his first WPT title when he won the WPT Rolling Thunder main event in northern California for $275,112. It was a particular special win for Gimbel, given what happened in 2015. These days, Gimbel lives with his brother back in Jupiter, although he does spend about six months a year out on the circuit. Gimbel already has three final tables and his big WPT win this year, so he’s playing with some momentum, but it’s his desire to get better that will earn him his next big score. With no plans to find a new profession any time soon, Gimbel sees the importance of ensuring that the game continues to flourish.